The Moosewood Cookbook's Brazilian Black Bean is now my go-to soup swap soup. Of course I meant to blog about the first impromptu soup swap I had back in December, but we all know how much I’ve been blogging these days. Starting again is like drafting that first post, when I couldn’t even type out complete sentences. Still, I’ve missed the daily discipline of blogging. I hope to recommit to this daily (hell, or at least weekly) practice these last four months of my pregnancy. Ladle your soup into yogurt containers for swapping. Or glass canning jars. Just be sure to leave extra head-space. Contents expand (jars can crack) when frozen. Fortunately, I can draw inspiration from the second soup swap I attended today, skillfully arranged by Chef Intaba through Slow Food Corvallis. 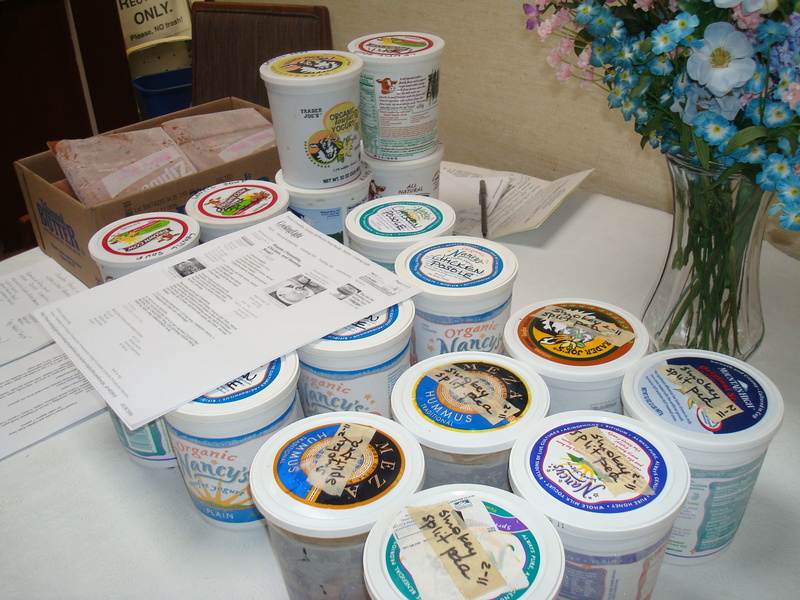 All the participants brought six quarts of soup, and then we traded. 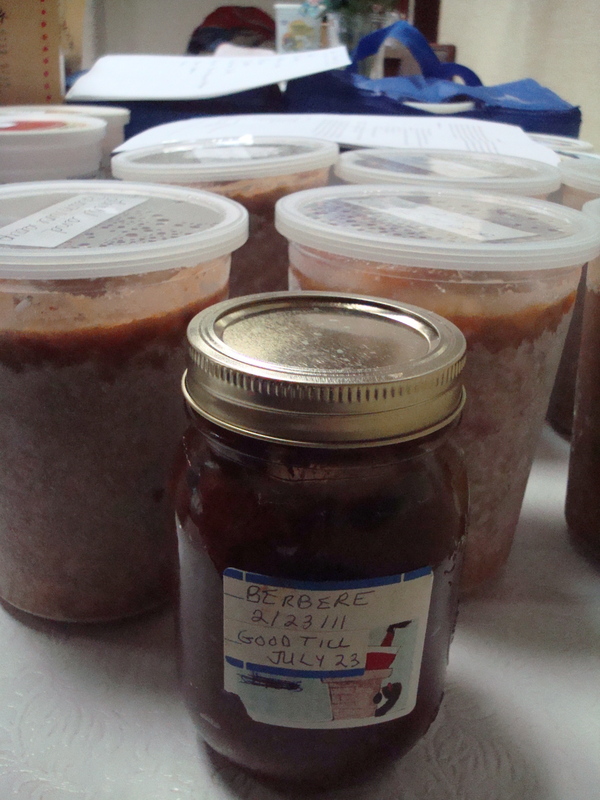 We returned home with six different kinds of soup to eat right away or store in the freezer (if you can find the space! That’s why folks invest in chest freezers here.) You come home with such variety, instead of tiring of that one big pot of soup that sits in the fridge ignored for a week. Portland-based food writer and radio producer Deena Prichep aptly captured the conviviality of these events in her soup swap pieces for The Oregonian and OPB. Rule #1 of hosting a soup swap, I’ve learned the hard way now, is to only prepare one type of soup. I made the mistake of preparing one to share and another one to share with guests during the event. Baltimoregon, when will you learn to put all your eggs in one pot? For both swaps, I made Molly Katzen’s standby Brazilian black bean soup from her Moosewood Cookbook (see recipe below), recommended to me years ago by Dan’s aunt Amy. Most Brazilian black bean concoctions–think feijoada–involve smoky pork, but the Moosewood recipe is, of course, vegetarian. It’s bright and citrus-y, punched up with orange juice, diced tomatoes, cayenne and cumin. 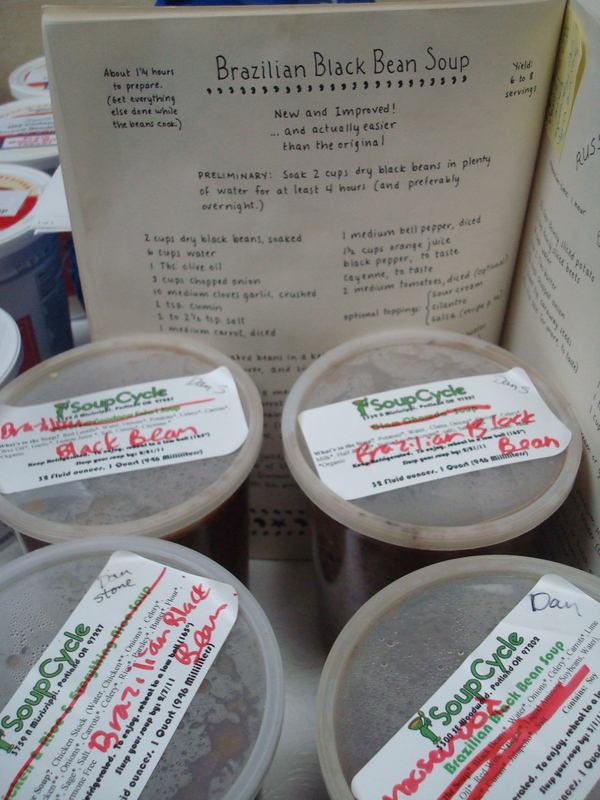 I even used locally-grown Black Valentine beans from Matt-Cyn Farms. Such events really showcase ethnic and culinary diversity. Slow Food Corvallis president Ann Shriver made an Ethiopian lentil soup with spicy berbere sauce. Several attendees made lentil soups, made with green French lentils that don’t get so mushy when cooked. One participant stressed lentil soup’s low-glycemic index, which she turned to when facing the risk of gestational diabetes while pregnant. Ethiopian lentil with fiery berbere chile paste. Another woman of indigenous Mexican descent made a healthy version of posole. Chef Intaba drew on her Jewish heritage with her grandmother’s split pea soup. We won’t tell anyone she subbed her own smoked pork belly for the flaken, which her bubbe stewed for hours in the pot. Another swapper offered potato-leek soup with German butterball potatoes to represent her heritage. A West African chicken and peanut soup served during our meal was also memorable. Now we have a fridge and freezer full of soup to get us through the week. 1 Place the soaked beans in a kettle or dutch oven with 4 cups water. Bring to a boil, cover and simmer until tender (about 1.25 hours). 2 Heat olive oil in a medium sized skillet. Add chopped onion, half of the crushed cloves garlic, cumin, salt, and carrot. 4 Saute over medium heat until the carrot is just tender. Add the rest of the crushed garlic and diced bell pepper. Saute until everything is very tender (10-15 mins). Add the sauteed mixture to the beans, scraping out every last morsel. 5 Stir in orange juice, black pepper and cayenne to taste, and diced tomatoes (optional). 6 Puree all or some of the soup in a blender and return to kettle. Simmer over very low heat 10-15 mins more. Serve topped with an artful arrangement of sour cream, cilantro and salsa. So, I made this soup last week. For my bell pepper I had both yellow and red in the fridge, and I used a combination. I don’t thrill to the idea of dicing carrots, so I grated it, and my garlic is rather small so I added a lot more than 10 cloves. I zapped it slightly with my stick blender at the end. It was so pretty. This soup was incredibly good! Hubby and Pops both ate so much I barely got a bowl for lunch the next day. As with many soups, it might have improved by sitting – it was so good the first time, it’s hard to rate an improvement. I heartily reccommend this. It is vegetarian (vegan if you leave off the sour cream topping), and gluten free, so it will fit most dietary restrictions. But my meat eaters loved it anyway!